"All the standard taco salad fixings (ground beef, lettuce, tomatoes and onion) are chopped and tossed together with two kinds of cheese, purple kidney beans, Thousand Island dressing and a generous helping of corn chips to create a kaleidoscopic party-pleaser." In a large skillet over medium heat, cook ground beef until evenly browned. Drain fat and set aside to cool. In a large bowl, mix together the ground beef, lettuce, tomatoes, onion, Cheddar cheese, Jack cheese and kidney beans. Cover and chill for at least an hour. Right before serving, add the dressing and corn chips and toss until evenly coated. This is great. I made a couple of changes, added taco seasoning mix to my meat and used ranch rather than Thousand Island dressing. 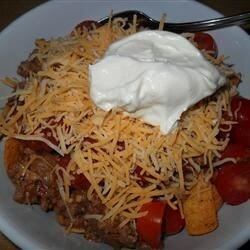 This is what we make with our left over taco meat...and it's delicious. I used French dressing and Mexican blend cheese. I also topped it off with chopped avacado and red onion. Thanks Sara. This recipie does not refridgerate well after the dressing is added.